The original article published by ECNFIN on March 25th, 2013 demonstrated that historically 88.76% of performance in the S&P 500 Index could be explained by the GDP. The data used in the original article included 56 annual observations from 1957 till 2012 (ECNFIN, March 25, 2013). In this recurring article, I included a smaller sample of data to focus on the most recent 10 years (see Table 1). Smaller and recent sample of data should reflect the current economic structure and its influence on the stock market. By decreasing the sample size, the explanation power of GDP declined to about 67%. The remaining 33% of the performance in the S&P 500 Index is not influenced by the GDP growth. The linear regression test is based on how the US GDP alone can influence the performance of the S&P 500 Index based on the most recent 10 years of data. R Square is equal to 0.67, which means that the US GDP growth can explain about 67% of performance in the S&P 500 Index (see Table 2). The t-Statistics for the US GDP is equal to 4.0619 is much greater than the critical value of 2.3060, using the significance level of 0.05. I can easily reject the null hypothesis that the coefficient on the US GDP is equal to zero. By testing the entire regression, I find that it is significant in predicting the performance of the S&P 500 Index. F-test of 16.4993 is greater than its critical value of 5.32, based on one-slope coefficients and 8 degrees of freedom. Since the actual value of F-test is greater that the critical value, I reject the null hypothesis that the all slope coefficients are equal to zero. In conclusion, the US GDP does have a significant effect on performance of the S&P500 Index. The next step is to forecast the US GDP for 2016 year. According to the economic projections of Federal Reserve Board Members and Federal Reserve Bank Presidents made in September 2015, the real GDP is expected to increase between 2.2% and 2.6% while personal consumption expenditure PCE is expected to increase between 1.5% and 1.8% in the year 2016. As the result, the nominal GDP is expected to increase between 3.7% and 4.4% for the year 2016 (The Fed. December 16, 2015). According to the Bureau of Economic Analysis, the current dollar GDP was $18,060.2 billion in the third quarter of 2015 (December 22, 2015). Combining the current GDP number with the projections for the next year, I can calculate expected GDP for the year 2016: $18,060.2 * (1+0.037) and $18,060.2 * (1+0.044). The expected GDP for year 2016 is between $18,728.4 and $18,854.8 billion. 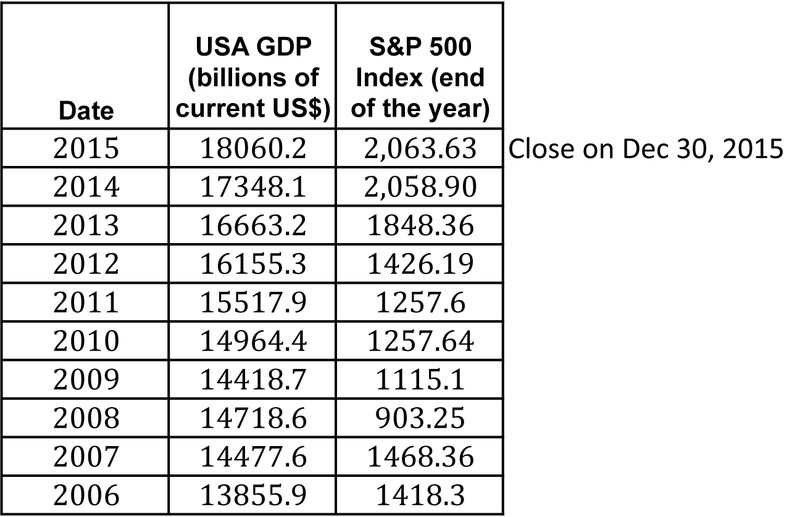 The S&P500 Index is expected to close between 2,200.81 and 2,230.00 at the end of the year 2016 based on the expected Gross Domestic Product (GDP) of the United States alone. Please note that the GDP alone can only explain about 67% of performance in the S&P 500 Index. The remaining 33% is not influenced by the GDP growth.